The oven is also great to have for emergencies. If you don’t know if your water is safe to drink put it in a dark pot with a lid in the oven. I have a Water Pasteurizing Indicator (WAPI) that I can drop in the water. The wax in the WAPI melts at exactly 150 degrees after 6 minutes which indicates the water is safe to drink. The oven can also be used to heat bath water, sanitize dishes or dry wet firewood during a power outage. For my oven’s first test run I put in a whole chicken, several whole Yukon gold potatoes, a few carrots, a sweet potato and a whole onion sliced in half. I used a 15-inch black graniteware roasting pan. (this is the largest roaster that will fit in this oven) I left the food in the oven for about 3 1/2 hours with temps fluctuating between 300 and 350 degrees. The chicken came out very juicy and falling off the bones. The sweet potatoes were melt-in-your-mouth good. The other veggies were tasty also. The carrots were slightly over done but came out great the next time when I put them in whole instead of chopping them into small slices. 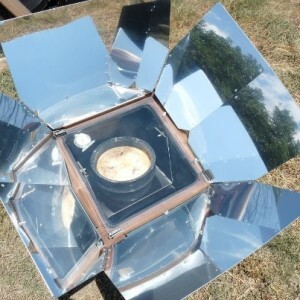 Thin dark metal pans work best for solar applications. Shiny pans should not be used as they reflect the sun’s rays back out of the oven. If you don’t have any other pans available you can drape a dark tea towel over the shiny pans. Make sure the towel is all cotton. Synthetics may melt. Glass or cast iron pans can be used but take longer to heat up than the thin dark metal. A pot with a tight-fitting lid should be used over all foods except baked goods. Without a lid steam will rise and cover the glass blocking out much of the suns rays. 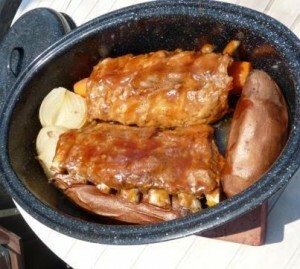 Baby Back Ribs, Sweet Potatoes and Onions Cooked in the Sun Oven. longer if you use a cast iron pot and lid. As long as there is sun the oven can be used no matter how cold the temps are. 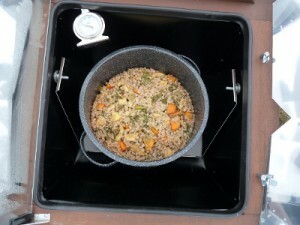 Sun Ovens have been used successfully at base camps of Mt. Everest where it gets below zero degrees. 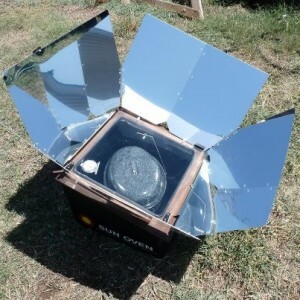 Food in the solar oven never needs to be stirred. The heat rises slowly and evenly in the whole chamber so there are no hotspots. 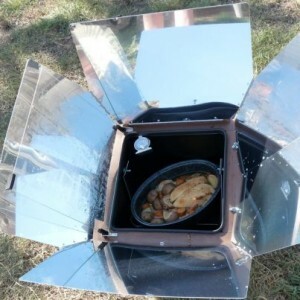 Anything that can be cooked on the stovetop or in a regular oven can be cooked in the solar oven except for fried foods. 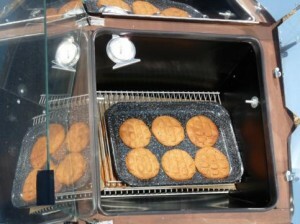 Cookies are about the only food you have to worry about burning in the sun oven due to their high sugar/fat content. I baked some peanut butter cookies today. I used stacking dehydrator racks to get 3 levels of cookies in the oven at once. They took 20-30 minutes to cook. In the regular oven they take about 10 minutes. The top rack was done sooner than the lower racks. I used small toaster oven cookie sheets on the top two racks and parchment paper on the bottom rack. The cookies have a slightly chewier texture from being cooked more slowly at a lower temp. dehydrating racks that fit into the oven at once. 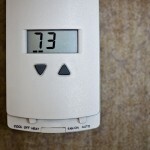 To dehydrate you would just turn the knobs that seal the glass door inward so it doesn’t seal allowing air to circulate. If insects are a problem you can cover the opening with netting. 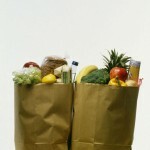 Fruits and vegetables take a day to dry. Meats may take 2 days. Seal it up at night and open it back in the morning to keep insects out if the drying takes more than one day. 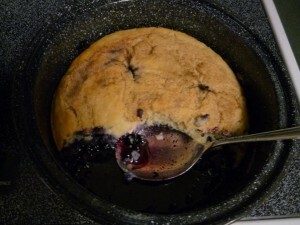 Blueberry Cobbler a few minutes out of the sun oven...yummy! oven! I can’t wait to try it camping or at a local park. They are allowed even where regular BBQ grills or campfires are forbidden since there is no flame and no chance of starting a forest fire! 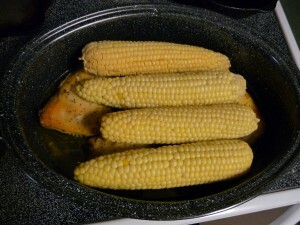 Fresh Corn on the Cob. Wrap in parchment paper and twist ends before placing in oven for best results. 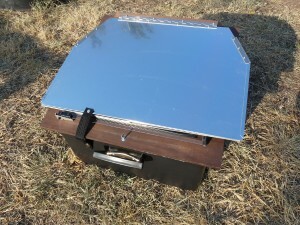 Solar oven folded down for storage. Very portable. 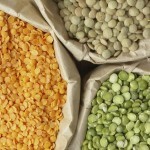 Anyone wanting to share sun oven recipes?